On left: an Vital Farms golden egg (hen naturally pastured on grass and bugs). On right: an egg from an operation that feeds organic grains but the hens are kept inside (no pasture or bugs). Eggs are one of the trickiest foods at the grocery store. Labels like “cage-free” (which means nothing), “free range,” “pasture-raised,” etc. 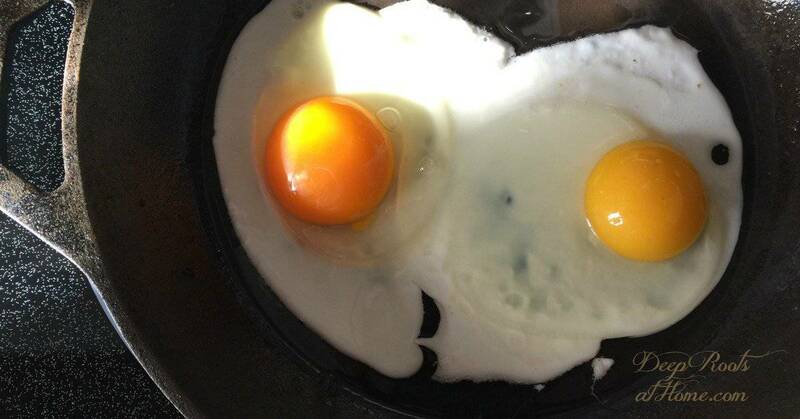 make it difficult to know exactly what you’re buying and which brands of eggs are best. If you have heard that naturally-raised, pastured eggs offer you a better bang-for-your-buck, even at $5.00 a dozen, that is true. Even than organic eggs (because the hens usually aren’t getting grass and bugs as I will show below). Hens on pasture with bugs, seeds and worms produce eggs that are better for us humans nutritionally and it is the best for the hens. As it turns out, all those lower-priced $-a-dozen, commercial eggs at your supermarket aren’t providing you or the chickens much of a choice at all. Eggs are another example where extra care for the laying hens pays big dividends for you, the consumer, and it is also more sustainable for the chickens and the land. This is our chicken tractor when we were at the farm. Plenty of grass and bugs. The U.S. Department of Agriculture’s labeling for poultry products can be misleading. For example, the labels “free-range” and “free-roaming” chicken simply require producers to demonstrate that the birds had access to the outdoors (but the hens may not know they can get out). In most hen-laying facilities, the food is given inside (thought they could get out), the hens stay inside close to their food supply so miss the sunshine, freedom and green food and bugs of pasture. Their hens lead a serene life with a natural bug and seed diet supplemented with certified organically grown, natural, non-soy grains on a free-choice basis. They comply with the strict organic standards set by the USDA and are annually inspected for compliance to be 100% “certified organic” in this small family operation. Nationally available from small flocks on grass in Montana. Rated tops at 5! 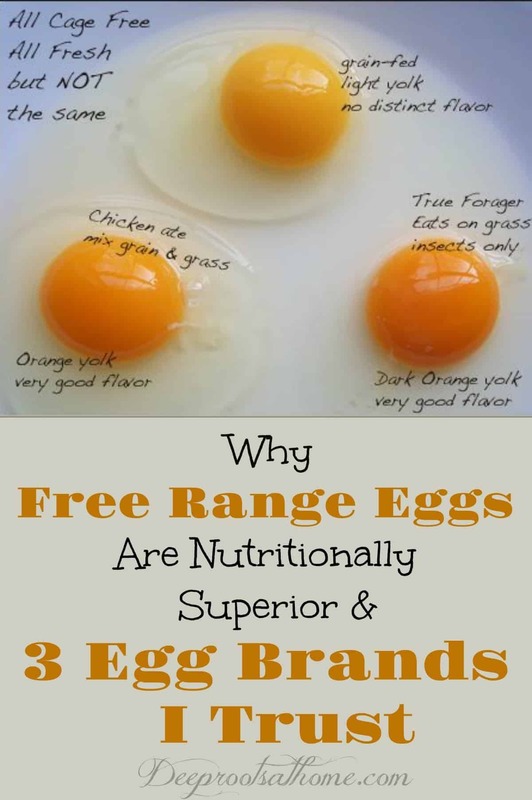 Eggs from pasture-raised and truly free range hens are the most nutritious and tastiest in my opinion. Backyard Eggs provide at least 108 square feet of pasture per bird, so the hens have a huge amount of space to roam and eat grass, bugs, worms, etc. (eating these little critters are what make the egg yolks so golden). Backyard Eggs and Vital Farms are products from the same company, but the Vital Farms eggs are Certified Organic. The hens are raised in the same way according to similar standards, but all their pasture and feed is organic. Vital Farms sell highly nutritious organic eggs raised by healthy, humanely treated chickens. If you can’t raise your own chickens, these are the best we know of. Cornucopia Egg Scorecard & Resources for Great Eggs! You can also check with the APPPA, American Pastured Poultry Producers Association, then you can look up by your state. You will be buying from a local farmer directly. Check Eatwild’s Pastured Products Directory to find free range and pastured eggs near you. Eggs are still one of the best food values there are. If you’re buying eggs for less than $4.00-4.50/dozen, odds are very good that your eggs come from inhumanely treated hens. It costs a lot to raise hens in the right way, which is why great eggs are priced higher than most regular grocery store eggs. Paying more for eggs guarantees you a better product and your farmer a fair wage, plus ensures better animal and environmental welfare. We have purchased a fixer-upper in the country on 2 acres. God-willing, we will be ready to move in within a couple of months. I want chickens, goats, and honeybees! Any suggestions on helpful resources to get me started in this planning stage? I really desire the kind of practical, no-nonsense wisdom that comes from experience rather than a textbook-type ‘manual’ that you end up tossing aside after the first week of real life!